The City of Charlotte is working with Mecklenburg County GIS staff to update our canopy coverage. We expect to have an updated canopy number by the end of 2017. City GIS staff will work to break up the data into more manageable pieces and a consultant will dig deeper into the data to complete a change analysis in early 2018. To date, three canopy assessments have been performed, starting in 2002, then again in 2008. 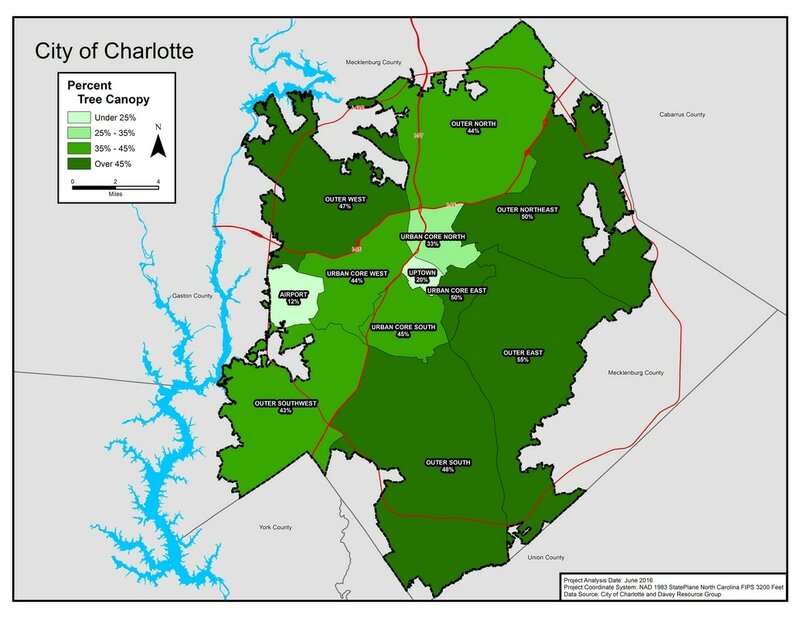 The last Charlotte tree canopy assessment was completed using 2012 aerial imagery. Industry standards call for updates every five years, which is especially important in a city like Charlotte that is experiencing so much growth. ​Learn more about Charlotte's existing canopy. The level of canopy cover also has a direct impact on the amount of benefits and services each neighborhood receives, including improvements in air quality, water quality, and property values. Learn more about the benefits Charlotte's trees provide. Regular canopy analyses provide a more comprehensive picture of what is actually happening on the ground and can lead to realistic solutions and remedies to canopy preservation. Canopy analysis can also provide insight on the impact of development and tree protection policies in place. However, technology assessing land cover from aerial imagery has improved immensely since its inception in the 1990s. For this reason, canopy data from assessments over time may not be an "apples to apples" comparison. Ideally, a multiple year canopy assessment completed at one time is really the best way to truly assess real change and challenges. Another canopy assessment should be completed using imagery from 2017 or 2018. Determine the analysis/studies needed from the next canopy assessment (see Further Study Loss from Development). Develop an RFP (Request for Proposal) for the canopy assessment based on data and analysis needs. Back to full list of action steps. Next Action Step: Implement a City Identity Campaign.